Lost Items – A tattered doll, a large urn on the mantle or a wedding dress in an otherwise empty closet? Sweet items on their own, but when they are the only items left in a vacant house, it can be a bit unnerving. Do a final check once you’re moved out, just to make sure no items are left behind—especially things that may be creepy in the wrong context! 4 Legged Critters – Rodents are scary. (Sorry, not sorry.) They are widely disliked (understatement of the year), carry diseases and can damage a house. Unless they are pets (aggh! ), then a rat problem should be taken care of ASAP! Mystery House – Sometimes there are doors that literally go nowhere. A door on the second floor that opens outside to a fictional balcony or just a door that opens to a solid wall, whatever the past use for the door, it’s of no use now and is just kind of strange. Believe it or not, this is much more common that you might think but should be fixed before selling, especially if it’s a potential safety hazard. 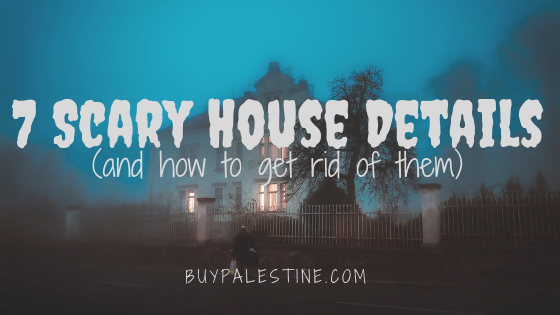 You definitely do not want to be referred to as the Winchester Mystery House when trying to sell your property. Deaths on Property – It is grim to discuss, but it’s also a part of life. In a small town with many historic houses, this is sometimes a concern for buyers. If the death on the property was from natural causes, it does not legally have to be disclosed. If the death was a murder or was somehow caused by the house (such as carbon monoxide poisoning), it has to be disclosed. Backyard Bodies – Some people may find that having a cemetery on a property is too freaky and others won’t mind it and will think it is neat. Many will fall in the freaky category. Hopefully it’s far enough away from the house that its not in constant view. If it is in plain view, consider planting some flowering trees (such crepe myrtles) to give a bit of separation between the house and the graves. Furry Baths – This is likely the most common of all scary home features. Mystery growths and petri dish conditions are not usually received well by buyers. The magic two-part fix: bleach and elbow grease. It just takes a bit of determination and the fur will be gone! The Stain Game—What is that dark spot on the floor? Blood? Wine? Candle Wax?–Isn’t this a horrible guessing game?! The fix is to scrub it away and/or shampoo the carpet or replace it. The same goes for these mysteries that appear on walls, ceilings, etc. As you can imagine, this guessing game has no winner. None of these features are a selling point, unless you are purchasing property for a haunted house attraction. In general, anything in a house that begs the question “what is that?” is generally not doing you any favors for a quick sale. After all, you want to have buyers beating down your door, not screaming out the door. Lisa Priest opens closets with caution and is an East Texas Broker/REALTOR® with Picket Fence Realty, Inc. You can reach her via phone or text at 903-948-3343 or read more at BuyPalestine.com.